After six straight quarters of accelerating declines, newspaper print advertising sales in the first half of this year fell to the lowest level in a decade, according to statistics released today by the Newspaper Association of America. Although the NAA touted a 19% increase in online ad sales to $796 million in the second quarter of the year in a spin-rich press release on the eve of the Labor Day weekend, print ad sales represented a bit more than 93% of the industry’s total volume of $22.49 billion in the first half of the year. So, let's get one thing straight: Improving online sales, while a good thing, won’t help an industry whose primary revenue base has been eroding at an ever-quickening rate for six straight quarters. The sales plunge in the first six months of the year, which occurred despite a robust economy, was paced by a 14.8% collapse in revenues from the three principal classified advertising categories – auto, real estate and recruitment. Sales of the Big Three classified categories were $6.8 billion in the first half of this year vs. just shy of $8 billion in the prior year. 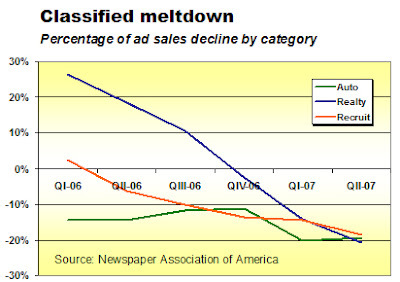 The extent of the classified sales debacle is illustrated in the graph below. What the graph doesn’t show is that auto classifieds have not shown positive sales growth since the first quarter of 2004. Help-wanted advertising last gained sales in the first quarter of 2006, but here's the back-story: Recruitment advertising, which hit an all-time record of $8.7 billion in the final year of the dot-bomb era, amounted to only $4.7 billion at yearend 2006. Thus, $4 billion in revenues have vaporized in this single category in half a dozen years. Real estate, which had been the one bright spot in classified advertising while the housing bubble inflated, has deteriorated with a vengeance since the start of this year. Remember that the sub-prime mortgage meltdown occurred after the period covered by these numbers. With the real estate market all but paralyzed, the year-to-date declines are almost certain to be equaled – or surpassed – for the balance of 2007, if not beyond. With consumers worried about the level of their household debt and the declining value of their homes, it stands to reason that advertisers will be more conservative about their spending in the second half of the year than they were in the first six months. Ergo, no relief in sight. Contrary to the chipper spin from publishers that online readership is growing robustly, the traffic at most newspaper websites has been flat – or worse – for the last year, according to a new report from Harvard University. In a study of 160 newspapers, the Joan Shorenstein Center on the Press, Politics and Public Policy found that the “record” readership gains heralded by the industry were produced almost entirely by the New York Times, Washington Post and USA Today, where traffic on average rose “more than 10%” in the last year. Although the Newspaper Association of America reported as recently as last month that a “record” 59 million unique individuals visited newspaper web sites in the second quarter of this year, the Harvard researchers reported that almost all the growth was generated by the high-volume sites operated by the name-brand national papers. UPDATE (8/16/07): The study provoked a sharp resposne from Howard Owens, director of digital media at Gatehouse Media, who called the report "bunk" in the Comments section below. Howard says traffic has improved at newspaper web sites since April, the month the study concluded. 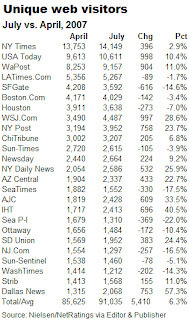 Statistics below for the 25 largest newspaper sites show that 14 gained and 11 lost traffic between April and July, yielding an over-all average increase in unique visitors of 6.3%. The gnarly challenge of accurately measuring site data is discussed here by Mark Potts. ADD UPDATE (8/17/07): The NAA's "own data indicates that web traffic to newspapers has been more or less flat for two years," says Harvard researcher Thomas Patterson in his full Comments below. "With more than a thousand newspaper web sites, it is possible to cite other newspapers that are gaining traffic. But we were not interested in selecting data to fit a thesis.... I wish it were different.... Some in the business can put a spin on the trends, but, if others believe them, they will end up delaying the adjustments necessary if local papers are to thrive in the Internet age." :: Unique web visitors gained an average of 40% at local TV websites and rose 35% for the national broadcast and cable networks. CNN bucked the trend, falling by 3.2 million visitors in the 12-month period. :: Traffic at local commercial radio stations grew 23% in large markets and 14% in small ones. By contrast, unique visitors tumbled 20% at National Public Radio’s site. In fairness, newspaper websites absolutely have more readers than broadcasters, because they have been publishing online much longer – and more effectively – than most broadcasters. Because papers have larger bases of site visitors, they have to add far more new readers than lower-traffic broadcast sites to achieve meaningful percentage gains in readership. With that said, however, faltering traffic is still faltering traffic. If it is not turned around, then newspapers can’t hope to maintain the double-digit increases in online advertising sales that have provided the sliver of silver lining in their otherwise gloomy earnings reports for the last five quarters. As discussed here, newspapers and other mainstream media for the most part have tin ears when it comes to developing content that appeals to online consumers. They need fix that. Stat. Notwithstanding shoot-from-the-hip speculation at the Wall Street Journal, it is unlikely Gannett is putting itself up for sale – or soon to be acquired by a media company or private-equity player. Seizing on some fine print in a new filing at the Securities and Exchange Commission in which Gannett’s top managers adjusted the rigging of their golden parachutes, a Journal blogger asked, “Is Gannett Girding for a Sale?” In the spirit of the Journal's uncharacteristic headlinese, all I can say is: Newsosaur Nixes Gannett Exit Yarn. Though the Journal may be right (and I, therefore, would be wrong), the chances of Gannett trying to sell itself are pretty slim, given that its stock is trading at a five-year low. Closing today at $47.34 a share, the stock is 47.6% lower than the peak of $90.42 it reached in April, 2004. When the shares of an asset producing high cash flows in monopoly-like markets are as depressed as those of Gannett, the company normally would become the target for a take-over by either a strategic corporate acquirer or a private-equity investor. While Gannett perfectly fits the description, these are not “normal” times for newspaper publishers. With newspaper revenues having deteriorated for five straight quarters despite a generally expanding economy, almost any imaginable acquirer would be petrified by concerns about the future strength of the business. Every publicly held newspaper company is fully stressed by the challenges involved in navigating its existing assets through though these treacherous times. Although the shares of Gatehouse uniquely have escaped the scourging suffered by all the other newspaper stocks, why would it, or any other publicly traded publisher, want its stock punished the way the market hammered McClatchy for the KRI deal? While a large, privately held newspaper publisher like Hearst or Newhouse could buy Gannett without risking the wrath of Wall Street, do those owners want to heavy up on an industry whose outlook is unclear, if not to say uncertain? A year or two ago, private equity buyers would have been all over the chance to buy Gannett. But the recent precipitous decline in newspaper values would make them fearful of overpaying for assets today that might be less valuable in the future. Further, the recent tightening of the credit markets would make the financing of any such transaction considerably more expensive by Labor Day than it would have been on Memorial Day. Wall Street Journal reporters should take care not to draw too many generalizations from the recent acquisiton of their company by Rupert Murdoch. As discussed here previously, News Corp. has the strategic imperative, market power and financial muscle to ensure the success of its costly acquisition of Dow Jones. But the DJ deal is one of a kind. In the absence of compelling reasons for any of the usual suspects to want to buy Gannett, the company, as far as these eyes can see, appears on track to remain independent. Things being the way they are today in the newspaper business, however, I can understand why Gannett's brass wanted to make sure their parachutes were secure. With objective data in short supply as to the efficacy of the new media initiatives undertaken by the old media companies, the following is sure to depress mainstream publishers. But they need to hear it anyway. Three weeks ago, Newsosaur’s admittedly modest traffic spiked to an all-time daily high of more than 1,000 visits as the result of this link from a blog called, I kid you not, Small Dead Animals. Two weeks ago, by contrast, Forbes and Business Week each quoted Newsosaur on their websites, and those links resulted in a single, solitary hit from a Business Week reader. So, there you have it: Small Dead Animals top Large Ones by 1,000 to 1. Newsosaur’s comments last week on the silliness of news helicopters and the likelihood of Rupert Murdoch behaving himself attracted not only a new link from Small Dead Animals but also links from such Large Ones as the Wall Street Journal, USA Today, the Chicago Tribune, the San Francisco Chronicle and the Philadelphia Daily News. Once again, the traffic generated by Small Dead Animals overwhelmed by a substantial margin the combined (but still gratefully appreciated) referrals from the Large Ones. Small Dead Animals is a creature of the web, by the web and for the web. 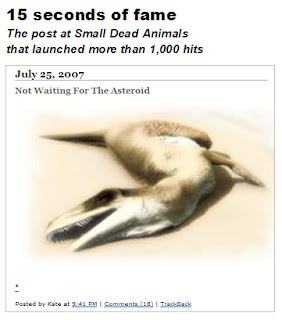 Unlike the blogs grafted as an afterthought onto the sites of Forbes, Business Week, the WSJ and the rest, Small Dead Animals is a primary destination for readers hooked on what, in this case, is the bracing point of view of Catherine McMillan, an airbrush artist and schnauzer breeder who resides in a small town in Saskatchewan. Although the Large Ones deserve a C+ for making an effort to add blogs and a few other modern touches to the print content they recycle at their staid and static sites, the banal results please neither their traditional readers nor the connoisseurs of such sites as YouTube, Gawker or the Huffington Post. As a result, readers of the traditional media have been conditioned over the years not to look to the Large Ones for the quirky news, dorky videos and (knee) jerky opinions that, for the most part, saturate the blogosphere. And Kos-inistas largely view the mainstream media, when they view them at all, as fodder for future potshots. With the formidable creative talent, market reach, commercial relationships and financial capability they possess, the Large Ones ought to have an enormous edge over Canadian schnauzer breeders in creating editorially compelling and commercially successful online content. But they are failing, because they try to confine their new media ventures to the tightly edited and carefully modulated conventions of their existing brands. If they want to be serious about the new media businesses, the Large Ones are going to have to establish skunkworks where people who really get the new media are given the resources and support necessary to develop original, independently branded fare. And the Large Ones will have to restrain themselves from over-managing these necessarily alien efforts. The coolest blog ever produced by someone at one of the traditional media companies is The Secret Diary of Steve Jobs, a stealth spoof penned by Daniel Lyons, a senior Forbes editor whose efforts evidently were unknown to the magazine until the New York Times unmasked him last weekend. Playing catch-up, Forbes.Com, to its credit, acted quickly to promote the Fake Steve diary on its site, where it now appears incongruously amid the buttoned-down coverage of fed rates, hedge funds and, ironically, the authentic Apple CEO. The question is whether Real Forbes can sustain the magic of Fake Steve. Or will Fake Steve fans flake when they realize their secret pleasure has been hopelessly co-opted? One of the biggest, most obvious stories not being covered by the media is the dangerous disintegration of the nation’s aging infrastructure. The frightening steam-pipe burst in New York City and the shocking collapse of an eight-lane bridge over the Mississippi are not isolated, idiosyncratic failures. They are proof that heavy traffic, the movement of the earth, metal fatigue, inadequate design, substandard materials, poor construction practices and, quite simply, old age will combine over the years to weaken the infrastructure we take for granted in modern life. As reported, sadly after the fact, the bridge that collapsed in Minneapolis was deemed “structurally deficient” in the “National Bridge Inventory” maintained by the Federal Highway Administration. To add a bit of graphic pizzazz to the story, you can plot the list of failing bridges in your town on one of the slick, new, free mapping technologies available from Google, Microsoft and others. For journalists eager to add crowdsourcing to their repertoire, this is a golden opportunity. They can deputize their readers, viewers and listeners to gather images and descriptions of cracking concrete, sagging powerlines and gaping sinkholes. Staffers can follow up on these reports by identifying the responsible authorities and putting the problem – and the name, phone number and email address of the official – in the newspaper or on the air. The San Francisco Chronicle has had enormous success with a feature it calls ChronicleWatch, though some identified issues admittedly remain unattended two years after the fact. There’s no reason to stop at bridges. The nation is filled with enough leaking pipes and crumbling roads to generate significant and riveting stories for years to come.